You might think 1,950 kilometers is one long trek, but it’s bound to feel a whole lot longer after an 0-6 road trip. 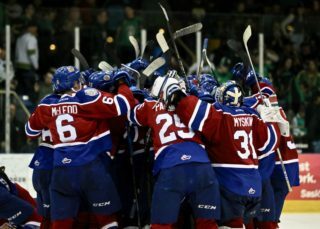 Tied 3-3 with 3:07 to play in the second period, the Edmonton Oil Kings (5-6-0-1) would surrender four unanswered goals to fall 7-3 to the Seattle Thunderbirds (5-1-1-0) in front of 3,656 fans at accessoo ShoWare Center in Kent, WA on Saturday night. 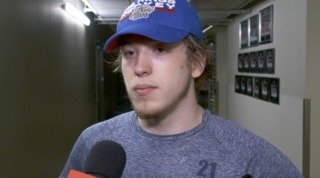 The game ends a six-games-in-nine-nights road trip which spanned 11 total days for the Oil Kings, who embarked on the trip with a 5-1-0-0 record, but return to the friendly confines of home looking for answers on how to get back to their winning ways. Dylan Myskiw (3-5-0-0) dropped his fourth straight, making 31 saves on 38 Seattle shots. 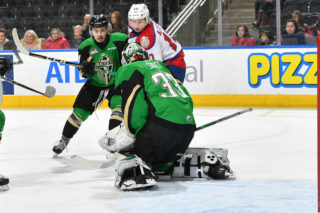 His counterpart, Liam Hughes (5-1-0-0) earned the win, staying strong in goal as the Oil Kings put forth an aggressive effort of 41 shots; Hughes turning aside 38. Simon Kubicek gave the Thunderbirds the first goal of the game, his third of the season from Jake Lee and Andrej Kukuca, at 3:40 of the opening period. 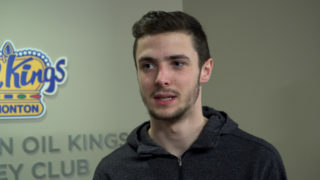 But less than a minute later the Oil Kings would answer back, as Brett Kemp tallied his seventh goal of the season at 4:24, assisted by Carter Souch and Wyatt McLeod to round out scoring in the first stanza. The Oil Kings dominated the shot clock, 18-10, through the opening frame. Kubicek would once again strike early in the second period, giving Seattle a 2-1 lead at the 3:26 mark from Lee and Payton Mount. 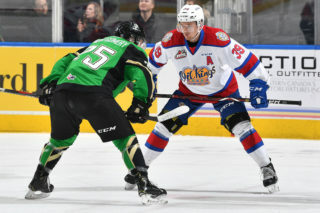 The Oil Kings look poised to even things up as the Thunderbirds were whistled for tripping at 4:58, but instead the home team took a two-goal lead as Dillon Hamaliuk’s sixth of the season made it 3-1 Seattle, shorthanded, from Noah Philp and Tyrel Bauer just 45 seconds later at 5:11. Edmonton native Liam Keeler tallied his first of the season, from Kemp and Souch, to bring his hometown Oil Kings to within one, 3-2, at 8:55. 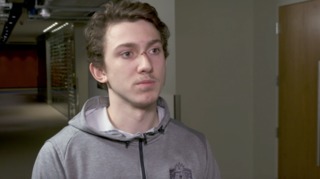 They would rally all the way back to tie the game, 3-3, as Scott Atkinson notched his third of the campaign on a slick one-timer, from Andrei Pavlenko and Vladimir Alistrov at 16:53. Things looked as though the two teams would head to the second intermission with a 3-3 stalemate, but Zack Andrusiak’s fifth of the season, from Nolan Volcan and Matthew Wedman, made it 4-3 Seattle with just 20 seconds left on the clock. Shots on goal were 14-13 Edmonton in the middle frame, for a two-period total of 32-23 in favour of the Oil Kings. Edmonton was called for hooking at 2:04 of the third period, then penalized for roughing just 28 seconds later, which gave Seattle a 5-on-3 man advantage for 1:32 – but they wouldn’t need that much time to extend their lead. Just nine seconds into the 5-on-3, the Thunderbirds made it a 5-3 game on the stick of Philp, from Lee and Hamaliuk, at 2:41. On the ensuing 5-on-4 they struck again as Philp scored his second of back-to-back power play goals, from Hamaliuk and Lee, to make it 6-3 at 5:07. The Thunderbirds iced the victory with Andrusiak’s second of the night, from Jaxan Kaluski and Volcan to make it 7-3 at 15:06. Final shots on goal were 41-38, Edmonton. Saturday also marked the 200th career regular season game for defenceman and Delta, BC native Conner McDonald. This season marks McDonald’s fifth in the League, splitting his time with the Oil Kings (114+ GP, 2017-present) and the Kamloops Blazers (86 GP, 2014-17). Seattle finished the night going 2-for-4 on the power play, while Edmonton was 0-for-4 with the man advantage. Simon Kubicek (SEA) (3), Noah Philp (SEA) (2), and Jake Lee (SEA) (1) were selected as the Three Stars of the Game. Wyatt McLeod, Ethan Cap and Conner McDonald each wore an “A” and skated as alternates to captain Trey Fix-Wolansky. The Oil Kings finally return home to Rogers Place on Friday, October 19 when they host the Red Deer Rebels for a 7:00 PM MT start.